Toweek – every day at 07:00 for the last 14 days. Tomonth – every week on Sunday at 06:00 for the last 4 weeks. Toyear – every month on 1st at 05:00 for the last 3 months. In case you deleted or changed a file or a directory, you can restore it from a snapshot. Restore from a snapshot can be done from Windows and from Linux. 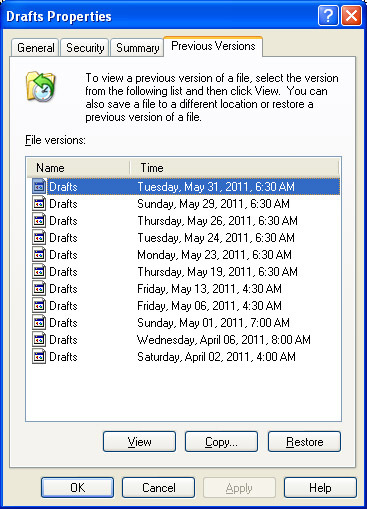 In the window which will open, choose: “Previous Versions” (see image below). Click on “View” and it will open a windows explorer view in which you can see the files in the folder. 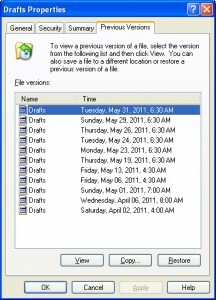 You can choose to open the file in order to see its content, or you can right click it and choose “Copy”, and then choose a place where to paste it. In case you just changed the content of a file, you can right click the file itself, and then follow the above steps # 1 and 2. In case you changed the content of a folder (deleted or changed a file in it) then right click the folder itself, and then follow the above steps # 1 and 2. In case you deleted a folder, right click the directory which contained the folder (it could be the “root” folder), and follow the above steps # 1 and 2. * Note: restoring a file / directory will overwrite the current file / directory. On the root directory, perform “ls .snapshot” or “cd .snapshot” and “ls”, note the dot in “.snapshot”, and note in “ls -la” one will not see the “.snapshot” directory, however, it is there. Under the .snapshot you will find directories, one for each existing snapshot. The Snapshot date is in the directory name. Select your preferred date and copy the desired data.